BubCap: How to prevent app switching! It is a common problem, you are working with your child using and iPad or iPod Touch/iPhone, you are in that key moment in an app where they are about to learn something, and boom, they reach over and hit the home button. All gone! They are crafty. We think we have found a very simple elegant solution to this problem; BubCaps by Paperclip Robot. What is a BubCap?, good question. BubCaps were developed to prevent toddlers from switching apps. 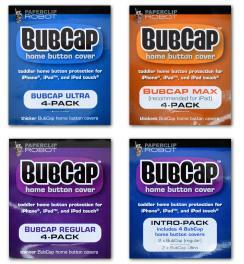 A BubCap is a small piece of flexible plastic that adheres over the home button on an iPod Touch/iPhone or an iPad. The way it works is that the plastic is flexible enough to allow an adult to press through the BubCap to activate the home button below. A child with less strength cannot activate the home button. They are sold in four pack for around $6.00 on Amazon. There is a forth option and that is the Intro pack, it has 2 Regular BubCaps and 2 Ultra BubCaps. I would recommend the Intro pack to start. If you know you have a strong child then you might want to consider just getting the Max BubCap from the start. This device is meant to be left on so that means if you share your iPad it will be something you need to get use to using on a regular basis. Experiment. I imagine this would be great for therapists and teacher who are using the iPad in a controlled manner. Please lets us know your thoughts and experience. BubCaps have been a godsend when working with my OT students! It keeps the students from closing out of an app when frustrated and gives me the time to redirect them to help them achieve a positive outcome! I have however switched over to the Ultra cause occasionally some of my kiddos were able to push through the Regulars… guess that means the therapy for strengthening those little fingers is working! Great invention not just for special needs. I continually hit home while reading…frustrating. No more. I got the max cap though, and everyone in the house complains that it’s TOO hard to go back to home. I might try another level. Our TapToTalk users tell us that they love BubCaps. As you say, this is a great, economical solution that prevents app switching by non-verbal kids who need to use their device running TapToTalk to communicate. Most of my students have quick little fingers. They was “their” preferred app activities and NOT the “work” apps. Their fingers were hitting the HOME button so quickly I felt defeated. BubCaps are a great solution! It keeps those nibble fingers from off the HOME button and keeps them on task! Hooray for Paperclip Robot and BubCaps! What a great idea! Can’t wait to try them. Thank you.